According to a provocative study/press release from the NPD Group, the average US multichannel television subscriber paid $86 for "basic pay-TV service" and "premium-TV channels" in 2011 and that figure is going to hit $123 in 2015 and $200 in 2020. NPD Group says that pay TV monthly rates have risen an average of 6% per year while consumer incomes have remained essentially flat. Keith Nissen, research director of NPD sees this trend as "unsustainable in the long term" and concludes "Much needed structural changes to the pay-TV industry will not happen quickly or easily; however, the emerging competition between S-VOD and premium-TV suppliers might be the spark that ignites the necessary business-model transformation of the pay-TV industry". Hmmm. Let's do some analysis of these figures. 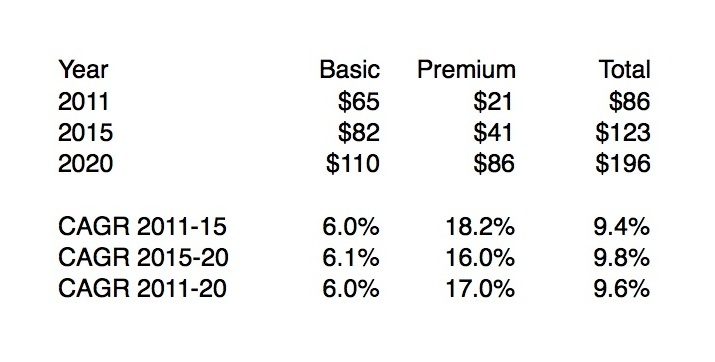 According to Multichannel News, the $200 is really $196 and that breaks down to $110 for basic and $86 for premium. Filling in the rest of the numbers (hat tip, Todd Spangler for doing the reporting) and looking at the growth rates, we can prepare the following table. The current 6% basic package price increases will continue forever; that's straight-line trend extension more than analysis, but not necessarily a bad place to start. Basic rates have grown faster than inflation for probably two decades now and basic penetration is now 86% per NPD's reckoning. A rational explanation would be that consumers are must be finding value in basic cable television, particularly with the recent stagnation in household incomes. If they didn't value it, they certainly wouldn't keep buying it. If you don't believe that, you haven't seen the data of how cellphones have eroded the market for landlines. A further rational explanation would be that the program quality of basic cable has increased dramatically by any reasonable measure. Regional sports networks have more pro games than they used to have, typically at the expense of broadcast carriage. Entertainment networks are putting greater resources into original programming and have turned out some real quality stuff (e.g., 4-time Emmy-winning Best Drama Mad Men). Up-the-dial channels like Bravo which ran older art movies and whose marquee show was Inside the Actor's Studio developed a slate of...watercooler favorites (if you must know, see this). Less commercial concepts like The Nashville Network and America's Talking gave way to the more-commercial stylings of Spike TV and MSNBC. This bounty is now spread across dozens of additional channels (Style!, Tennis!, not just one but two food networks! ), almost all of which are in high definition which is not just good but necessary because 65% of households now have sets that a 15 years ago were primarily found in the high-end room at Best Buy. Will that all continue? It sure could. More investment in programming, more channels, TV Everywhere would allow people to use their subscription in more places on more devices, maybe a technological advance like 3DTV -- all these elements could increase the value of the basic service. In fact, I think it could grow faster than 6%. 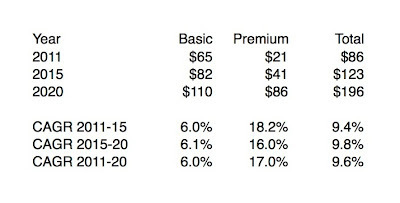 The interesting part of the NPD analysis to me is that premium programming retail pricing will increase much faster than basic, no less than 17% annually over the next 9 years. At first blush, that makes no sense at all. Basic programming is a take-it-or-leave-it bundle and that gives it a lot of pricing leverage. If you need ESPN, you need to take the whole package. Ditto for Disney Channel or MTV. We know that basic is a fairly low-churn subscription service. The other part of premium television is transactional -- pay-per-view movies, events and things like out-of-market sports packages (e.g., NFL Sunday Ticket, MLB Extra Innings). Many of these offerings have substantial competition from over-the-top players. The only way that premium television retail pricing will go up by 17% annual leaps (and bounds!) is if the cable operators are tapping other revenue streams (e.g., DVD purchases, movie theatre tickets) and that will only happen if the service itself becomes much more compelling that it is today. If that happens, it is more than likely that the program quality of these offerings will have increased and/or the convenience of using the service will increase (for example, the highly compelling HBO Go) or both. In short, if the average bills are going up this much, that's probably very good news for viewers of premium television. "In fact, 59% of pay-TV subscribers preferred having one single provider for their pay-TV services, compared with 21% who desired multiple providers, and 21% who expressed no preference. Sixty-two percent of subscribers wanted premium TV either delivered by their pay-TV provider directly, or from a service affiliated with their pay-TV provider." The key word here is "preferred". Consumers would "prefer" to get everything from one provider (less technical hassle, fewer bills to pay, etc. ), but if the cost differential is significant..."the lure of convenience may not be enough if the content is available and people can access it without going over some set broadband cap." (well put, Stacey Higginbotham in GigaOm's The cable industry isn't stupid, is it?). This is the future that I see for multichannel television, because the cable industry is many things, but stupid is not one of them. The cable guys will choose to hold onto the high-quality, high-price segment of the market and effectively give up the lower end to alternative solutions in whatever forms those solutions may take. Right now 14% of households rely on antenna service for television. Maybe 10-20% of the multichannel households leave the increasingly spend-y pay-TV market That's a business different from the one now, but consistent with the major driving economic factors. Does Ikea TV Beat Apple to the Punch?